Having read to numerous posts on 🍏SE like 1, 2, 3, 4, which all predate iOS 11 and having looked into VLC, Vox, Documents, and of course the files.App I hope someone else has already figured out how to download and conveniently play audio files (mp3, m4a etc.) 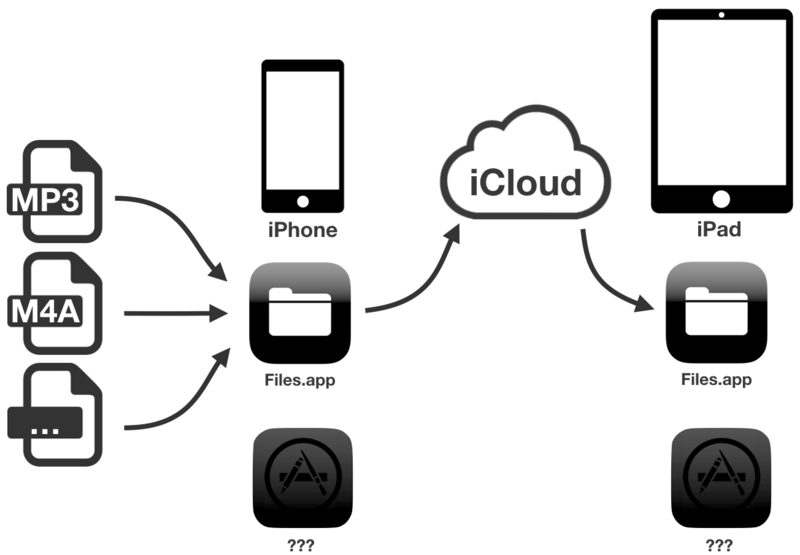 within iOS, across multiple devices. Without the need to use iTunes on PC or Mac, I would like to be able to use the iOS Files app to store and organise audio files (e.g. audio-books, lectures, talks, speeches). These folders and files are automatically synced via iCloud (this is the part which obviously and fortunately works already). The other part of my set up seems to be the tricky one (is it a apple developer policy thing?). I would like to use an app (I am happy to pay for it) which has access to the audio files. I know I can just play single files from within the Files app. But the Files app does not feature album arts and playlists. Also file-browsers like the Files app or Documents do not remember which files I have listened to the last time or where I stopped. Has anyone figured out a work-flow or found an app which would support my use-case? Browse other questions tagged ios icloud audio filesystem mp3 . How to download an MP3 to an iPod Touch? Are there any audiobook apps that will remember where you last left off? Apple/iOS: record videos via iPod touch; reduce video size? Can I configure my iPhone to play audio files through ear speaker instead of the bottom speaker? Would the new HandOff app in iOS 8 and OS X Yosemite work on iOS 7? Solution for moving WAV raw audio files from SD cards directly to IOS devices? Can I view hidden files and directories from the Open or Save As dialog boxes without making them visible in the Finder?